I have been floundering between projects again. For some reason I've been having trouble sticking to one thing. I ended up restarting my Birds of a Feather Mystery Sampler. I decided to use 40 ct. Vintage Pecan Butter instead of the Lentil (or Navy Bean). I like it much better on the Pecan Butter. I decided to go darker after seeing Amy's pretty wip at our get together in Manning. And then when I got bored with Ann I got VoHRH back out. I have worked on this one the longest lately. The black fill in is making me a little bonkers! I'm determined to get this block done though. I'd love to be able to stick to one thing and stitch it! Maybe I can do that for awhile with VoHRH. I just want to say thank you to everyone who has bought items from my stash sale!! I really appreciate it!! :) Hope you all are having a great start to summer! Beautiful progress on everything. The Pecan Butter is gorgeous fabric for the mystery sampler. Despite the ADD, you are working on some gorgeous pieces! I like the Pecan Butter...it warms up the sampler. Those are all wonderful pieces! I really like the Pecan Butter. I haven't gotten a piece of it yet, sadly. I want some! so glad you are back for a while and posting! I always get a charge when I see a new post from you. I say that sometimes you need to flit between pieces and sometimes you stay with one for awhile.....just how it goes....we should just let ourselves do what comes naturally! All your WIPs look great Nicole. I have my first piece of Pecan Butter on order... I can't wait to get it and pick the perfect project to stitch. There's nothing wrong with ADD. You're got some great project going so I think that it would be hard to stick with just one for very long. 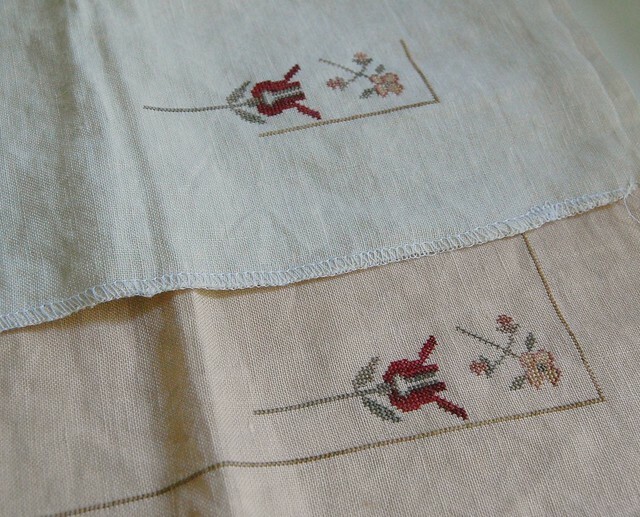 I think I like your choice of linen much better for the Mystery Sampler. I might have to order some of it just for future projects. I was wondering where you have been and glad to see you are back!! Your fabric for the mystery sampler is looking really nice and I love to see your Ann's progress as you are stitching from totally opposite side from where I'm stitching. I'm hoping to get where you are someday, but it will take for awhile... Enjoy your days without the kids around the house!! I like the Mystery sampler on both of your fabrics although the Pecan Butter has my preference as well. Lovely color. Ann and VoHRH are both looking great too. I never get tired of seeing Ann Grant. The colors always blow me away! Pecan Butter looks like a beautifully soft color. I love your progress on all of your WIPs. I must check out the butter pecan for the mystery sampler. Both versions of the mystery look wonderful. Your WIPs are so pretty Nicole! I like both versions of the Mystery Sampler and Ann Grant is really looking beautiful. Good luck with all that black fill on Village! Your WIPs are wonderful. I also think the Pecan Butter helps to enhance the colours better. No wonder you're having ADD, they're all great projects! Your BoaF looks great on the Pecan Butter! Have fun doing just what you want! Great WIP! That Butter Pecan fabric is lovely! Yep, definitely adding that one to the next stash order! Lovely, just lovely!! That Pecan Butter fabric is absolutely gorgeous...I am going to have to order some of that myself, LOL! As always, all your projects look great. I love the Pecan Butter and can't wait to see how it looks as you progress. I really like the pecan butter fabric better also. Good choice. All of your pieces look great. Its hard to stick with one project. Thanks for sharing your pieces with us. All your WIPs look great, I think I prefer the darker fabric for your Mystery. I can't remember what colour I ordered for mine, just waiting on it arriving. All of these are so gorgeous! Great going! Nicole, Mystery is pretty on the V. Pecan Butter - great choice! The colors in Ann are beautiful, aren't they? 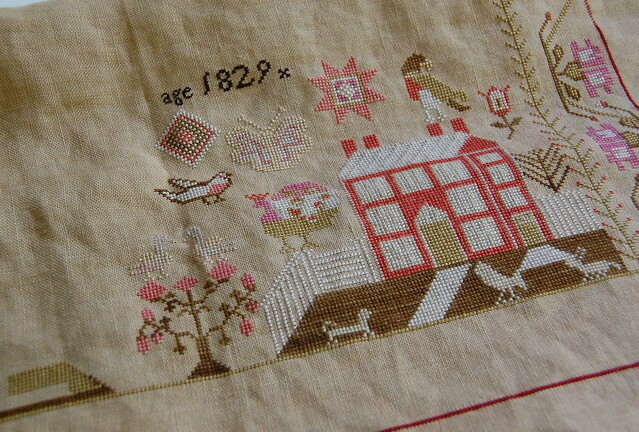 I look forward to stitching that someday. Way to stay with VoHRH. 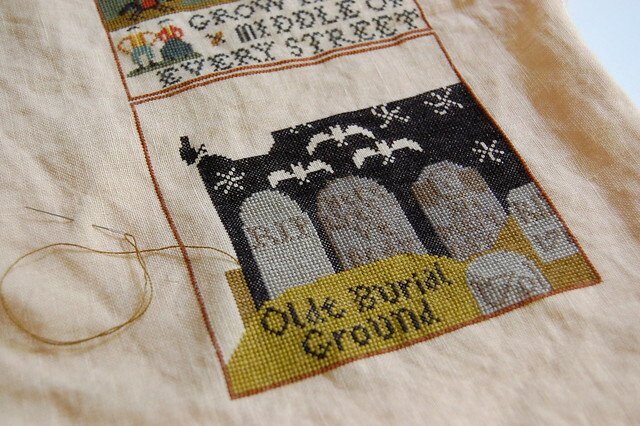 I've read other blogs where the graveyard block gets tedious to stitch. I want to lie down and whimper a little bit after seeing your gorgeous WIPs! I love the mystery sampler on the Pecan Butter. I need to get a piece of that at some point. I love love love your Ann Grant, too! Maybe, with VoHRH, do a strand of black per day? I hate fill in, too. They are all lovely projects. Your stitching ADD sounds so like me.